UFO Jim - "Dancing With Aliens"
"And she explains that a musical UFO swings through time itself as old boyfriends swim through the mystic night." -from Hieroqlyphic, by UFO Jim. UFO Jim inhabits a strange world where giant bugs wear business suits, UFO’s fly over Mexico, beautiful princesses live in trailer parks, Santa Claus is a lecherous, booze swilling bluesman, and aliens lurk around every corner waiting to abduct the unsuspecting. Combining bar band blues-rock with psychedelia and avant-garde influences, a wickedly grinning, appropriately bizarre sense of humor, some electronica style beats, and a dash of Calvert era Hawkwind, UFO Jim spins his crazy tales like some wild roadside prophet who’s seen a bit too much. The album kicks off with the infectious and spacey stomp of the opening cut, China Belle, which takes the listener on a surrealistic journey along San Francisco’s famous wharf. From there, it’s off south of the border for Mexico UFOs, a track that features a wicked, deep psychedelic guitar jam. Doctor’s Daughter reminded me the most of Hawkwind. Throw in Bob Calvert on lead vocals and it would not have been terribly out of place on an album like Astounding Sounds or Quark, Stangeness, and Charm. The fact is, every single track on this album is a winner, from the deliriously off-kilter title cut to Kris Kringle Song, which slyly exposes Santa Claus for what he truly is. Towards the end of the album, UFO Jim delves into experimental territory, with the dreamy, slightly disturbing instrumental Alien Portal and the funky, dark electronica of Elektrika. The charm of this album is in its quirky sense of humor, that’s for certain, but UFO Jim also provides some solid and wildly creative guitar chops and genuine inventiveness in his sound too. Like the UFO’s he likes to sing about, his album came out of nowhere and simply took me away, and now I’m dancing with aliens too! For more information, e-mail: capricerecords@webtv.net or ufojim@hotmail.com. 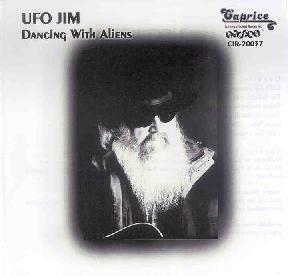 Or visit UFO Jim’s CDBaby web page at: http://www.cdbaby.com/cd/ufojim.